Judging by various posts in particular those in the mathematical quandries thread it seems like there is a large number of us from scientific backgrounds. For FUN I was thinking about doing a sort of competition where we use our science knowledge (including hypothetical and just weird) to show how we would become the ultimate mad geniuses and take over the world. Anything (PG13) goes including alliances, backstabbing, pure sci fi. I have no idea how I'd score this or even how it will work if it does but I thought I'd see if we can give it a go. (It might be helpful if we described our background in our first post to show what kind of knowledge we had) By the way non-sciency people just as welcome. I've a degree in electronic systems so my basis is electronics and software with a reasonable maths/physics back up. I will probably take part later but for now may the games (hopefully) begin. I'd love to play but someone will have to start and get the ball rolling so I can get some ideas. Take over the world, ehh? I don't know about that. Destroy the world... Sure. But take it over? Sounds like an awful lot of work. I'll have to sleep on this one. I will then retreat to my pre prepared vault/bunker somewhere in europe with my carefully selected volunteers who will form my master race (seeking people of all backgrounds as long as they're sarcastic ****holes). Once in my vault I will trigger the devices and wait till everything's calmed down. at which point I will repopulate the earth with an entire civiization of sarcastic "jon snow"s.
Please tell me that those carefully selected volunteers consist of at least one pair of incompetent goons who mess everything up, a female ninja/assassin type who wears lots of leather, and a clever but wimpy scientist type who ends up turning on you in one final act of self-redeeming bravery (and dying for his efforts)! Also, this bunker absolutely must contain a hidden trapdoor leading to a pirhana tank, activated by a hidden mechanism from your throne-like swivel chair, on which you swivel to face heroes who unexpectedly burst in! Oh, and you need at least one elaborate auto-execution machine for when you capture somebody trying to thwart your plans, because simply killing them there and then is a definite no-no. Instead you must put them in the machine, then walk away, confident that the hero will absolutely not escape this machine and return to continue to hamper your efforts. @Squire How could I not I'm the perfect villain, I'm English! @skinnydragon ah but when I captured you earlier and explained my devious plans to you I lied. I told you where they are and what kind of nukes they are, what I didn't tell you was I designed a failsafe that would detonate the nukes in the event of someone trying to use an EMP to disarm them. The best lies are mostly truthful so I made it so even if you got past my expendable (don't tell them that) mercenary army any attempt at disarming the nukes would result in detonation. sure a complete genius and expert with that tech could disarm one of them if they opened it up but that sort of genius is rare indeed and there were multiple nukes hidden at each site And some of the sites are half a world away from each other, theres no way you could disarm them all in time, even one detonation could cause a cataclysmic extinction event. I'm still not sure exactly why I'm telling you all of this though. Nothing so crude as EMP targeted spikes are monofrequency monodirectional think laser compared to light bulb. I could pick a single component to fry without hitting the fail-safe. Or new plan dump a load of carbon on the bombs and then pour lead and concrete on them. So you blow up the US and Russia by detonating nuclear weapons in launching facilities? you've also released huge amounts of radiation. In what way does this plan help you? At least my mass extinction event would have avoided irradiating the entire planet, supervolcanos are far cleaner killers than mass nuking even if I was going to use a few nukes to trigger them. You could always have just asked to be part of my master race, you didn't just have to ruin all of my plans. at least I'm safe from the fallout in my bunker. I guess I'll just have to sit here stroking my cat. If the had to take over the world I would probably launch thousands of tiny missile in to space and eliminate all to the communications satilites. At the same time I would cripple the worlds space programs and strategically disable essential server so the Internet and phones shut down. Then I would retreat to my secret space station and announce to the world that I can fix all of there problems if they surrender full leadership of their nations completely to me. I would promise to set up a competent government order, and soon the nations would come begging for me to rule them. Some of the more egotistical one(I'm looking at you, America) would probably "fight for their freedom" but once I had a few on board I cold probably deal with that easily. Then I would restore communications, solve the worlds ecemomic and social issues, and set up a solid constitutional monarchy. Not only would I rule the world, but I would be a hero who brought world peace. Nothing brings people together like a common enemy. Ballistic missiles can guide themselves, they have no need of satellites and GPS to find you, unless you can make yourself invisible they can paint a target by eye and program the missile to hit your space station. Uhhh... They still need to be able to find me. I'm in a secret space station, remember? true but unidentified space objects are suspicious and you know how much the United states government likes to shoot things. Good luck building your ****hole civilization in a place filled with radiation. I'm sure they'll all be in great health. Of course, the radiation has its uses, but you'd need to make sure that only those who resist are hurt by it. the point of the bunker is to wait out the worst of the radiation. like fallout. 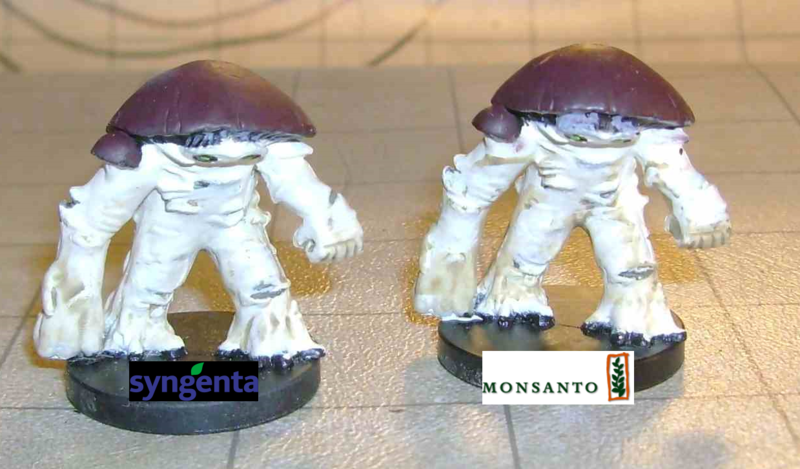 Forget Amn vs Baldur's GAte, how about The Agricultural Biotech Civil War? So I think I'll do a semi-regular recap/summary of our moves and their likely affects. Between me and @wubble we have irradiated a reasonable portion of both America and Russia. I'm going to assume that no politicians are going to have nuclear silos in their own back yards however so they aren't quite out of the fight though. @wubble has also launched a nuclear strike on the volcano at yellowstone so even greater devestation to America. He is hiding in a bunker in an undisclosed European location. @meagloth has struck at several key communication nodes including satelites and the internet. He is currently making diplomatic moves to offer to restore communications in echange for fealty. His hideout is an undetectable space station. Several thousands of people are hanging up feeling just as annoyed with telephone services but strangely happy about someone called @skinnydragon although they currently have no idea who that is. @booinyoureyes has deployed at least two genetically modified fungal lifeforms. The current lack of communications infrastructure is hampering our ability to know more about their locations or capabillities. American Government *gets out map of world dartboard and throws dart* Approaches UN with "proof" that where the dart hits was behind the terrorist attacks on their soil and demands a task force to prevent terrorism. Russian Government makes claims that Ukranian hackers supported by western governments are responsible. Demands reparations and threatens escalation of the conflict in Crimea. British Government despatch hunter-killer subs to take down the "rogue" vanguard. The official investigation finds further evidence to support America's claims. EU non-commital backing of Britain and America. Use their support as bargaining chips in Britain's treaty renegotiation.